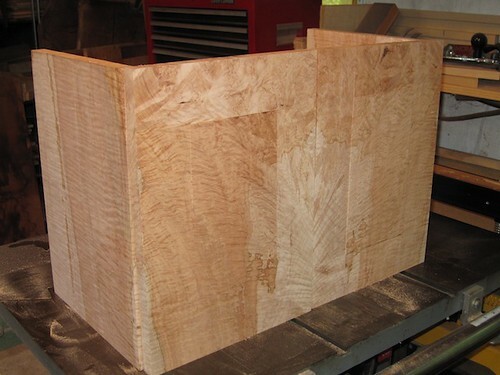 Solid figured Maple and Claro Walnut. 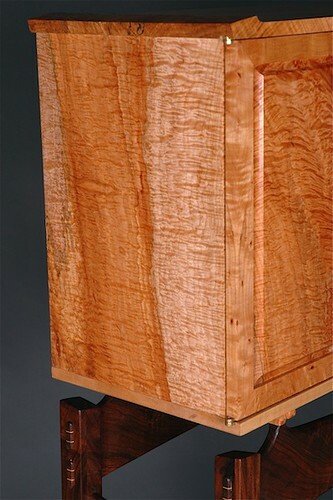 The cabinet is 27” wide, 17” tall and 12” deep, and it stands 58” tall overall. 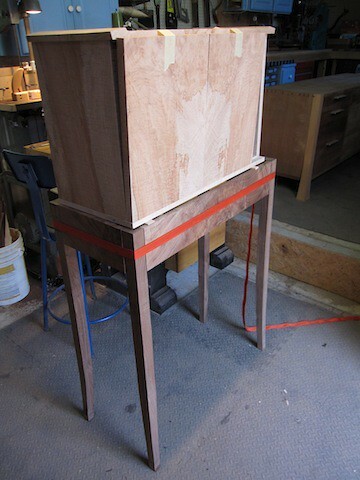 I’ve always wanted to build a freestanding cabinet. Its something I’ve been dreaming about and designing in my head for years. 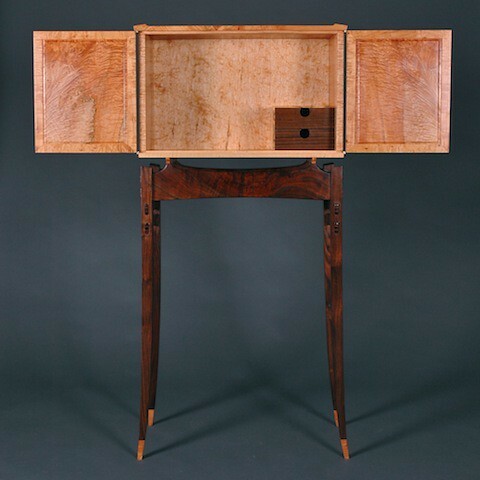 I’ve always been so inspired by James Krenov and many other woodworkers past and present. It was the most fun and most rewarding piece I’ve built so far. 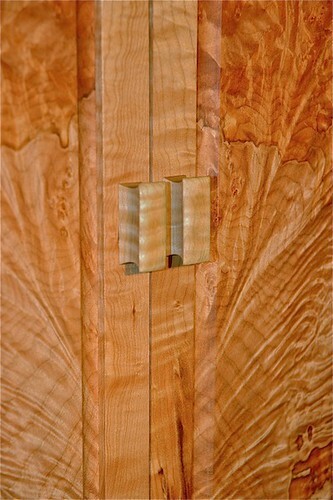 I have to apologize to my fellow Lumberjocks, I usually follow my projects with a photo blog. But I selfishly kept this one to myself. I had to. I didn’t want any distraction, any input, anything to break my stride. I took a few photos at a couple of points along the way but mostly just concentrated on the work. I didn’t even track my hours on this project. I joyfully lost track of time with this one every time I went to the shop. So I have no idea how long this took but my guess is around 50-60 hours. UPDATE: I have spent the last few weeks sanding and finishing. 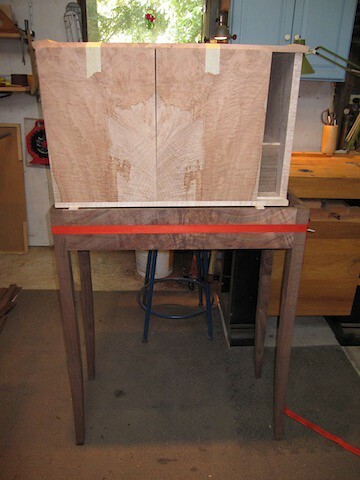 I sanded the cabinet to 500 grit inside and out, and up to 1500 grit on the top, sides and door panels. 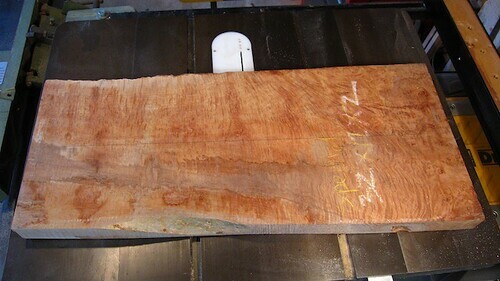 Then I layered on 6 coats of hand-rubbed Formby’s low-gloss tung oil & varnish (each a day at at time), and then I polished it with 3 coats of wax. 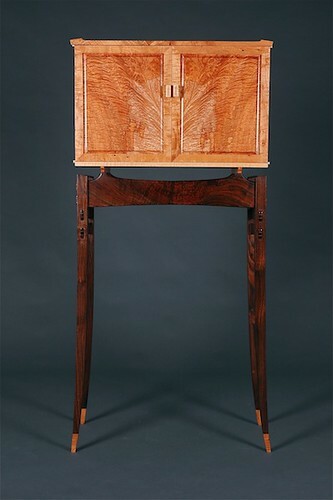 Then I was finally able to take the cabinet to a friend’s professional photo studio to take better photos of it. I took the photos myself but they are much better with the borrowed backdrop and strobe lighting. 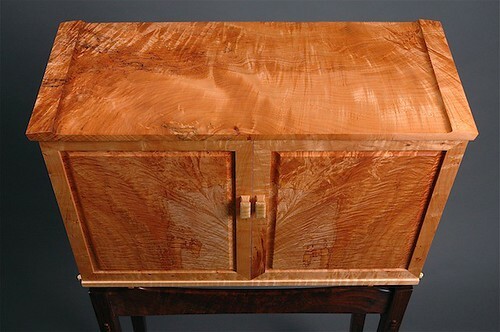 All in all I would estimate I am easily close to 100 hours of designing, building and finishing time. 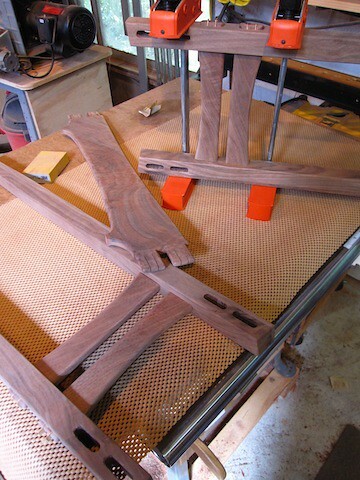 Shaping the legs took for-ev-er. 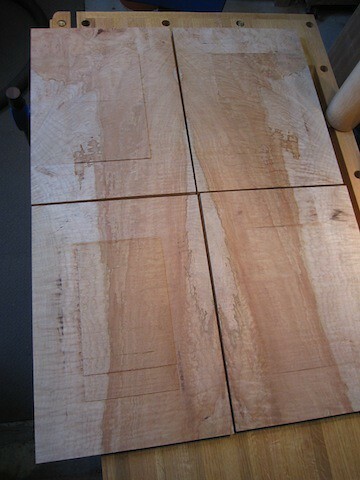 The oval wedged mortise and tenons were cut and shaped mostly by hand. 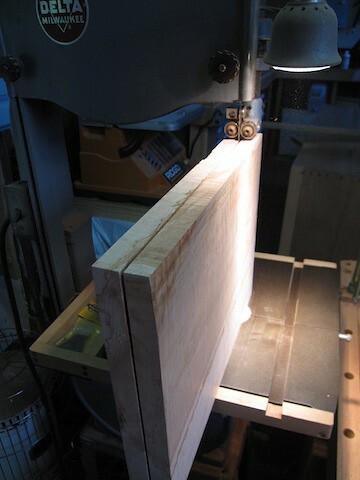 I don’t have one of those fancy router jigs. 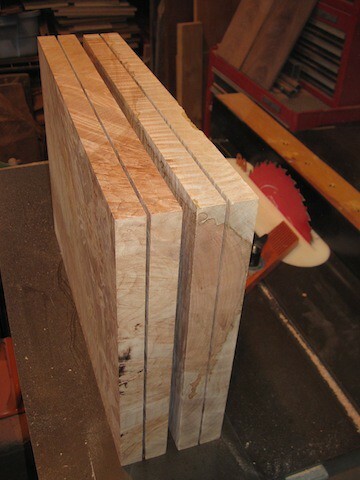 I just cut the mortises with a forstner bit on the drill press and rounded the corners of the tenons with a file. 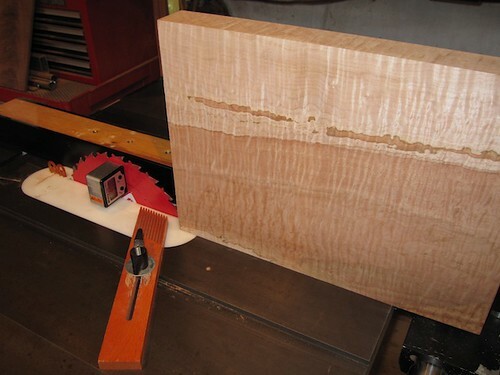 The micro wedges are actually maple veneer. That is an amazing looking piece. The wood is gorgeous also. Now I understand your envy Blake. This beautiful piece of art clearly denotes your influences. Beautiful. Professional work. Love the style and the contrast. Wow. Absolutely beautiful. There are so many design details, that I don’t know where to start. 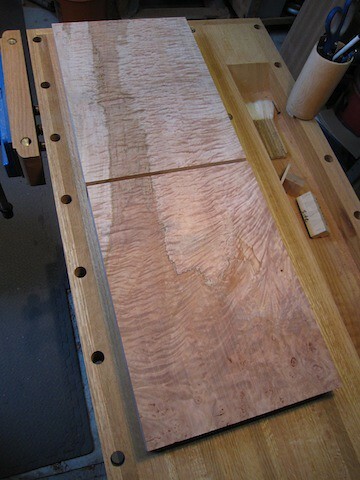 And I do like the resaw on the table saw before the bandsaw. I have never tried that, but it looks like it worked really well for you. 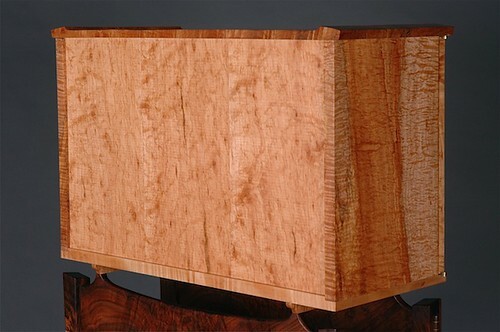 Awesome grain matching, fantastic design, craftsmanship is awesome as well. Very, very nice Blake! 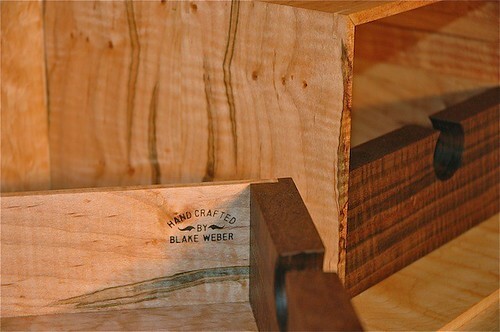 Blake some fantastic work and a great creation. P.S. I’m going to favorite this. This gives me an awesome idea for a jewelery box that I would love to build for my daughters birthday coming up in November. 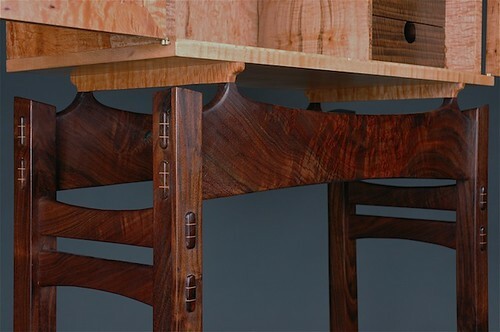 beautiful, ... i love the grain and your joinery. this piece has connected with its inner zen,.... its in balance with the universe. thanks for sharing. 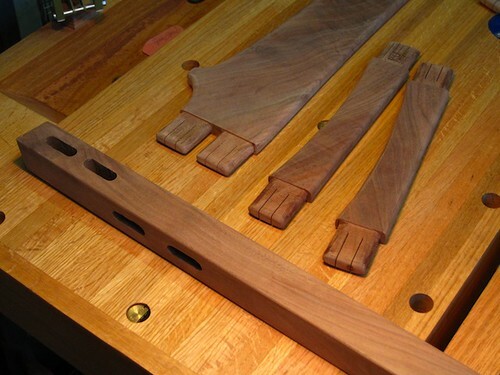 Matching the resawn pieces is a tour de force. Wonderful. 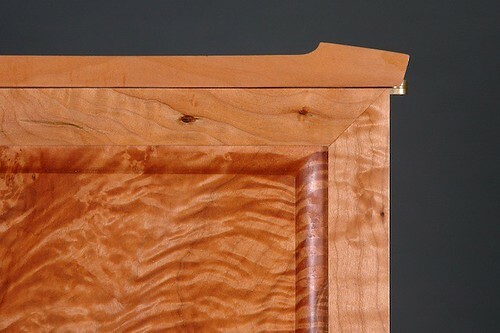 The grain of the wood is unreal. The design is great to look at. It is a fine piece of work.